While many viewers of this 2007 episode of the medical drama House may not have understood the significance of the MDR1 gene, Washington State University’s Dr. Katrina Mealey and her fellow veterinarians did. Mealey discovered the MDR1 gene mutation in certain dog breeds six years earlier. This nod from popular culture is cool, but pales when compared to the numerous accolades Mealey has earned since her discovery. The breed-specific aspect of her work has drawn interest and recognition from the Food and Drug Administration and National Institutes of Health, both of which sponsor research that explores the link between genes and drugs in humans. Dr. Katrina Mealey, DVM with her dog Bumpus. Dr. Mealey invented a gene test to detect an animal’s predisposition to a fatal reaction to antiparastic drugs, saving the lives of countless pets each year. Katrina Mealey is the Richard L. Ott Endowed Chair in Small Animal Medicine and Research at WSU, the founding director of PrIMe (Program in Individualized Medicine for animals), a National Academy of Inventors member, and global expert in veterinary pharmacogenetics. She heads WSU’s Veterinary Clinical Pharmacology Laboratory and as of July 1, she is the newly appointed associate dean for research in the College of Veterinary Medicine. Most recently, Professor Mealey also earned the 2018 WSU Woman of Distinction Award. Mealey had barely graduated from high school when the antiparastic drug ivermectin came on the market, which quickly became known as a super-weapon for animals and humans against parasites, such as mites, heartworms, and lice. In a small percentage of certain dog breeds, however, veterinarians found an ivermectin treatment could prove fatal. While the antiparastic could cure a poodle, it might kill a collie. Based on those results, veterinarians followed the guideline, “White feet; don’t treat.” But, no one really understood the why behind the differing responses. Around this time, Mealey started as an undergraduate who planned to attend veterinary school but took a detour first, earning a BS in pharmacy from University of New Mexico. She went on to earn a DVM from Colorado State University and a PhD in veterinary pharmacology from Texas A&M. She first conceived the idea that would lead to her invention while working on her PhD. Mealey had read about a study in the Netherlands involving lab animals and their negative reactions to ivermectin. She suspected a hereditary component was responsible for the varying dog breeds’ responses, and it piqued the interest of other veterinarians. Then, in 2001, leading a group of WSU researchers, she discovered that a gene mutation called MDR1 predisposed herding dogs—collies, shelties, Australian Shepherds and Old English Sheepdogs—to react violently to a deworming pill. Since her initial published findings in a 2001 issue of the journal Pharmacogenetics, Mealey discovered 12 other dog breeds, including Long-Haired Whippets and Silken Windhounds, are susceptible. Mealey invented an easy, affordable cheek swab test to determine whether a dog carried the altered DNA. Her laboratory also discovered a different mutation in the MDR1 gene of cats, and now offers genetic testing for cat owners who wish to prevent adverse drug reactions. In 2004, the first U.S. patent was issued to WSU for Mealey’s invention. She now holds nine national and international patents licensed on four continents by eight different companies, and these have generated more than $1 million in royalties and licensing fees for WSU. Six years after the patent was issued, Mealey’s genetics tests earned the best new pet products of 2010 by Dr. Martin Becker on Good Morning America. Today, WSU distributes the diagnostic test throughout the US and has licensed labs in Europe and Australia. Katrina Mealey is also the founding director of PrIMe and said that WSU’s veterinary hospital is the only one anywhere that provides individualized medicine. “We have a team of about a dozen PhD students, post docs, and other professionals,” she said. Discoveries made by WSU faculty in PrIMe have raised the standard of care for veterinary patients. Mealey said that every student who graduates from the College of Veterinary Medicine will be prepared to provide cutting-edge, high-quality veterinary care to their patients. 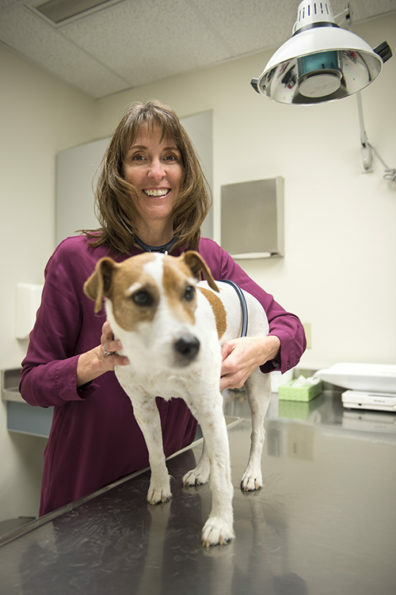 Because Mealey serves as interim Veterinary and Clinical Services department chair, she’s not in the lab every day. Plenty of work still gets done though, because of “her amazing staff.” The goal of the lab’s research is to prevent adverse drug reactions in veterinary patients, which increase patient morbidity and mortality, and add to the overall cost of veterinary care. They also put emotional strain on the animal lover. Recently, the lab discovered the genetic cause for drug-induced retinal toxicity and blindness in cats associated with specific antibiotics. Thus far, they have only seen it in cats, but human patients who received a compounded fluoroquinolone formulation have shown negative effects. When describing what it’s like to be the Richard L. Ott Endowed Chair, Mealey said, “Because someone has invested in me, I want to bring my work up to a higher level.” Recently, she was invited to talk about her work at NIH, and Mealey is the only veterinarian among researchers studying how to improve brain penetration of HIV drugs. Mealey has authored more than 100 publications, including research articles and book chapters. She provides leadership and mentoring to high school students, undergraduate and graduate students, and junior faculty. Mealey serves on and has chaired numerous committees at WSU, and has been on the editorial board of several scientific journals. Outside her professional duties, she is an avid runner who has completed numerous marathons, including the 2013 Boston Marathon. While her research has saved countless animals’ lives, obviously there’s more to come.